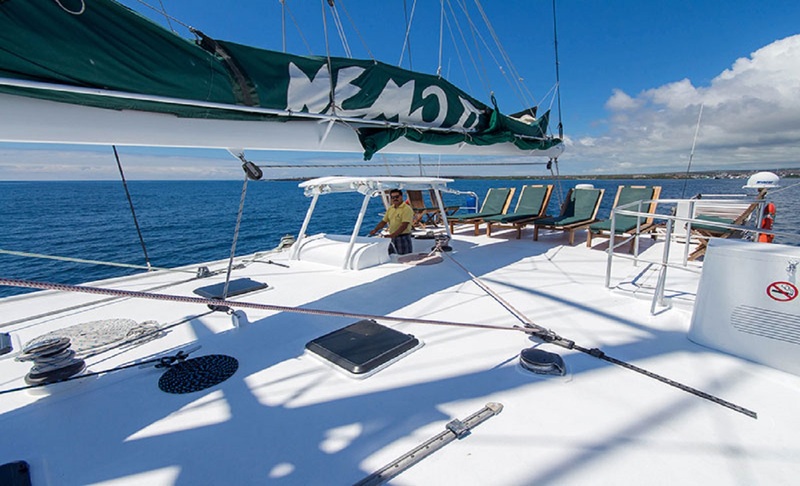 Experience paradise on earth aboard the Nemo II which provides an all-inclusive 8 day cruise to passengers with daily excursions to explore the Galapagos islands. 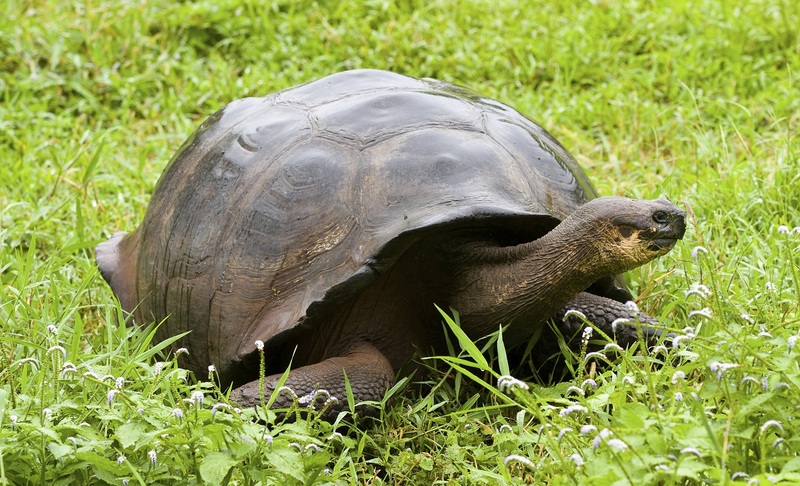 The Galapagos Islands, became famous worldwide due to the research done by Charles Darwin. It is well known for its stunning beauty, nature and history. 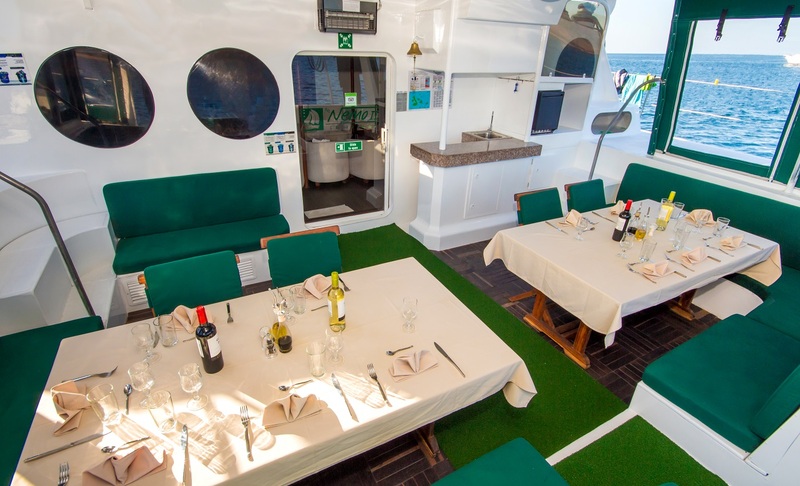 The Nemo II is a first class cruise vessel with modestly designed interiors and spectaculars social areas. 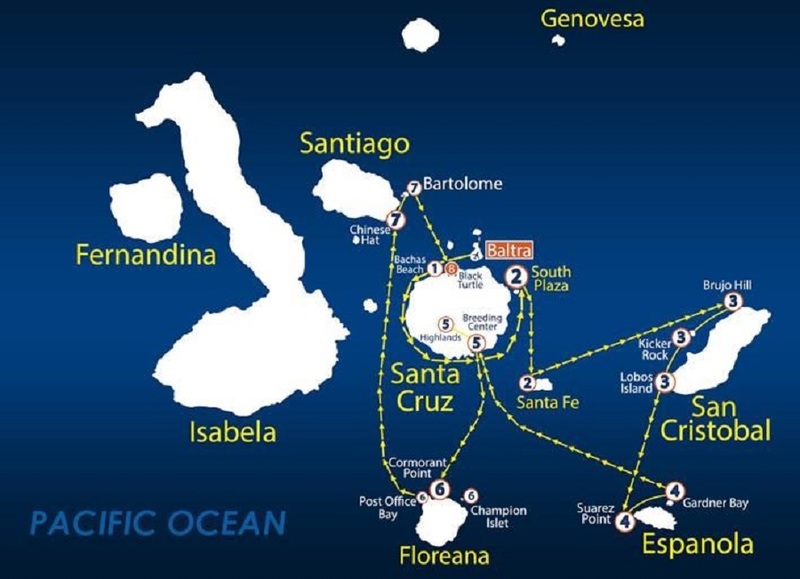 During the cruise you will journey to the most visited islands including Santa Cruz, San Cristobal, Espanola and Baltra. 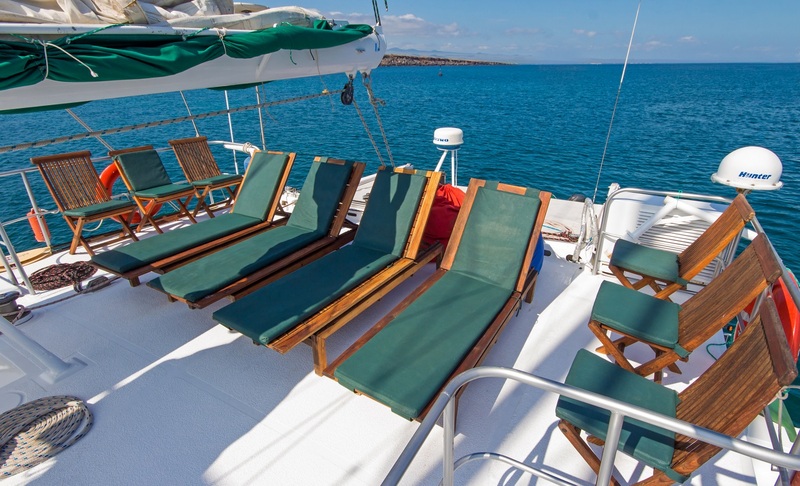 Indulge in the best bird watching experience in the Galapagos. Stroll along the beach and meet hundreds of playful sea lions! 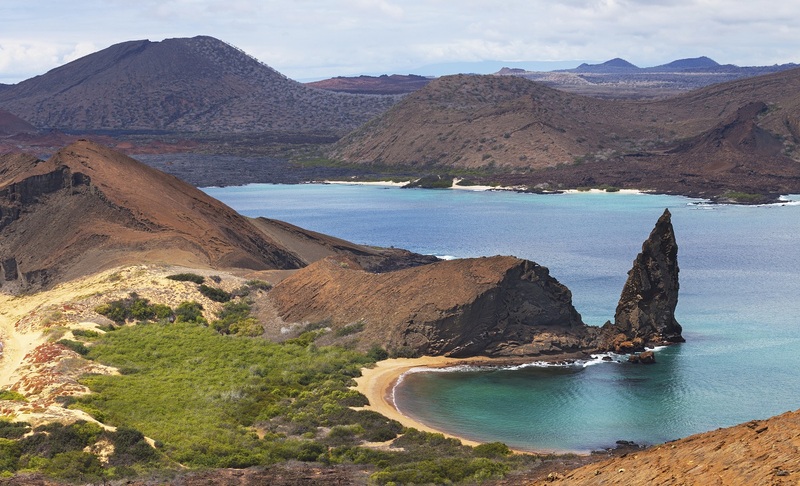 Visit the most photographed island in the Galapagos - Bartolome! Arrival to the airport in Baltra, reception by the cruise guide and transfer to the yacht. Navigation to Bachas Beach. The name is “Spanglish” for 'barges' which were wrecked offshore during the World War II. A common first landing site, there is a delightful swimming beach here, with a lagoon behind, and a longer beach for a stroll and wildlife- watching. The saltwater lagoon behind often has great blue herons and small waders such as sander lings and semi-palmated plovers. Both beaches are nesting areas for green sea turtles, which leave tracks in the sand to the back of the beach, especially from November to February. A wet landing and open area on the beach mean one can explore at leisure. 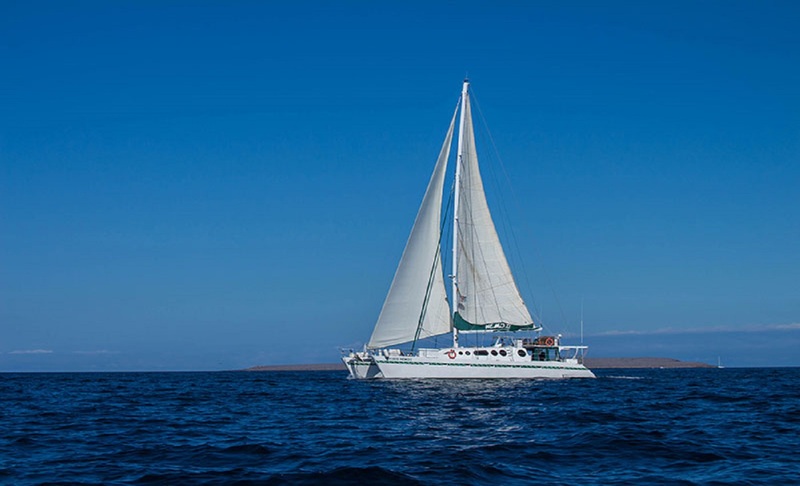 In the morning visit to Santa Fe Island, home to one of the most beautiful coves in all the Galapagos, Santa Fe is located in the southeastern part of Galapagos, 2 1/2 hours from Santa Cruz and 3 hours from San Cristobal. Santa Fe was formed from an uplift (rather than a volcano) giving the island a relatively flat surface rather than the typical conical shape of the other islands. Visits to Santa Fe begin with a panga ride across the lovely turquoise lagoon. Once ashore you are brought into contact with of the many sea lion colonies in the Galapagos. Bulls vie for the right of beach master while cows laze in the sun. 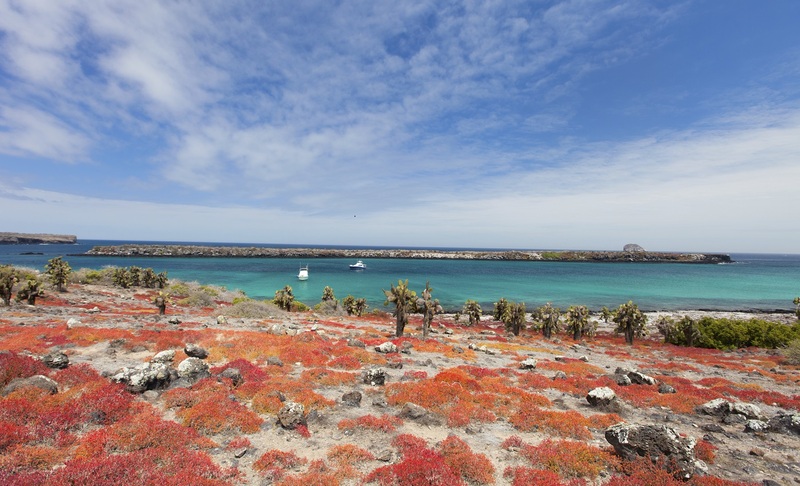 The loop trail around the islands leads past the salt bushes where Galapagos Hawks can easily be approached. Santa Fe is home to endemic Land Iguanas. These iguanas are the largest in the islands and they are beige to chocolate brown in color and resemble small dinosaurs. Reaching the summit there is a stunning view of the cove beneath. Visiting South Plaza in the afternoon begins with a dry landing. The rocky trail circumnavigates the island displaying the combination of dry and coastal vegetation zone. South Plaza has one of the largest populations of Land Iguanas in the Galapagos. The Iguanas seem to be everywhere once you land. These larger than average Yellow-Brown Land Iguanas feed on the fruit and pads of the Prickly Pear Cactus.South Plaza is also home to Marine Iguanas living along the coast and a Hybrid Iguana whose fathers are Marine Iguanas and Mothers are Land Iguanas. As the walk continues along the sea cliffs Swallow-Tailed Gulls, Frigatebirds, Audubon Shearwaters, Red-Billed Tropicbirds, Brown Pelicans, Blue-Footed and Masked Boobies are frequently seen. Beneath along the shore a colony of Bachelor Sea Lions can be seen. 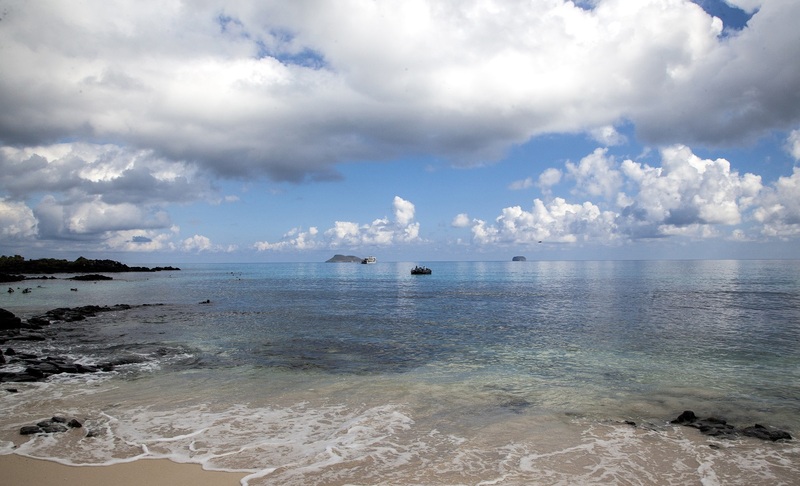 One of the first sites visited by Charles Darwin, Cerro Brujo is a beautiful white sand beach where brown pelicans, blue-footed boobies, sea lions, and marine iguanas are all found. An onshore version of nearby Kicker Rocks, Cerro Brujo is a very striking, eroded tuff cone. Kicker Rock. Also known as León Dormido these rocks are located of the coast of San Cristobal. 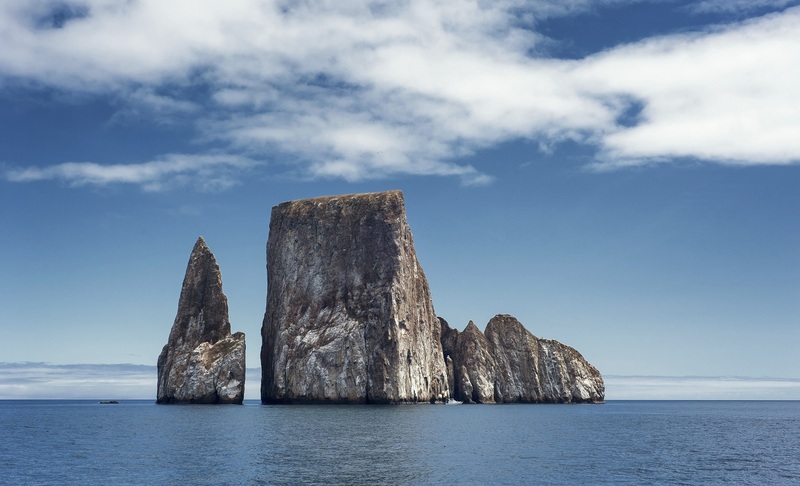 It is the remains of a lava cone eroded by the sea, the two vertical rocks rising 500 feet from the ocean form a small channel that is navigable by small boats. This natural monument has become a favourite sight for cruises due to the many tropicbirds, frigates and boobies that fill the surrounding air. 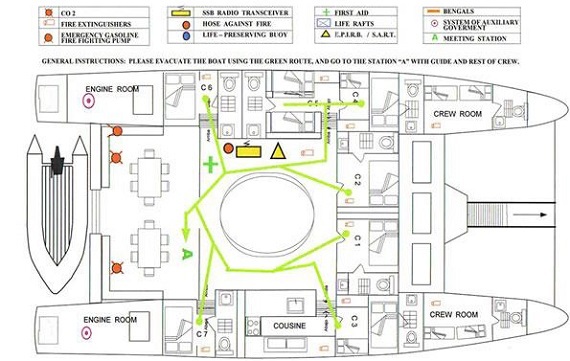 however many cruises do spend 45 minutes to an hour allowing you to enjoy the full experience. 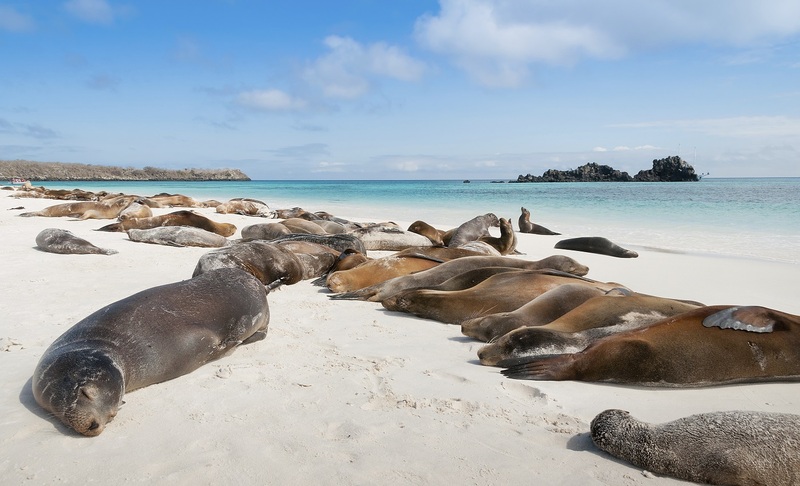 Lobos Island, as its name suggests is famous for its population of sea lions and fur sea lions. You will also encounter a nesting ground for the great frigate bird and a small number of blue footed boobies breeding centre; here it is explained, in a simple manner, the natural phenomena that created the Galapagos Islands. They explain the series of natural processes, such as volcanic eruption and marine current locations that have lead to the amazing islands that you are now visiting. Dinner at night and navigation to San Cristobal. Arrival to Española Island, in the morning Punta Suarez, found on the western tip of Española, Punta Suarez offers great wildlife such as Sea Lions, sea birds and the largest Marine Iguanas of Galapagos. 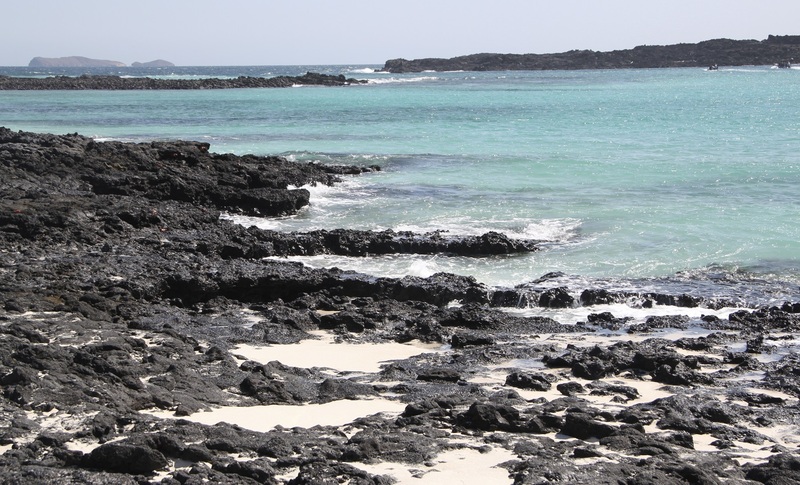 This is one of the best sites in the Galapagos. The amount of wildlife is overwhelming. Along the beach there are many Sea Lions and large, colorful Lava Lizards and Marine Iguanas. As you follow the trail to the cliff's edge Masked Boobies can be found nesting among the rock formations. As you follow the trail to the cliff's edge Masked Boobies can be found nesting among the rock formations. After a short walk down to a beach and back up the other side Blue-Footed Boobies are seen nesting just off the trail. Visit to Gardner Bay, this bay is a 45-minute boat ride from Punta Suarez. It has a white sand beach and there is a small colony of sea lions. The possibilities for swimming or scuba diving are excellent here. 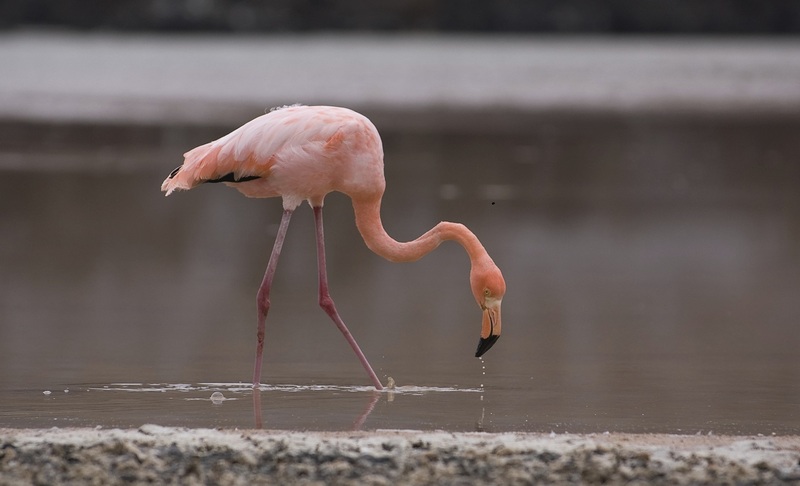 Visitors find migrant, resident, and endemic wildlife including brightly colored Marine Iguanas, Española Lava Lizards, Hood Mockingbirds, Swallow Tailed Gulls, Blue Footed and Masked Boobies, Galapagos Hawks, a selection of Finch, and the Waved Albatross. The highlands of Santa Cruz have incredible zones of vegetation. There you will visit the private finca “Las Primicias”. 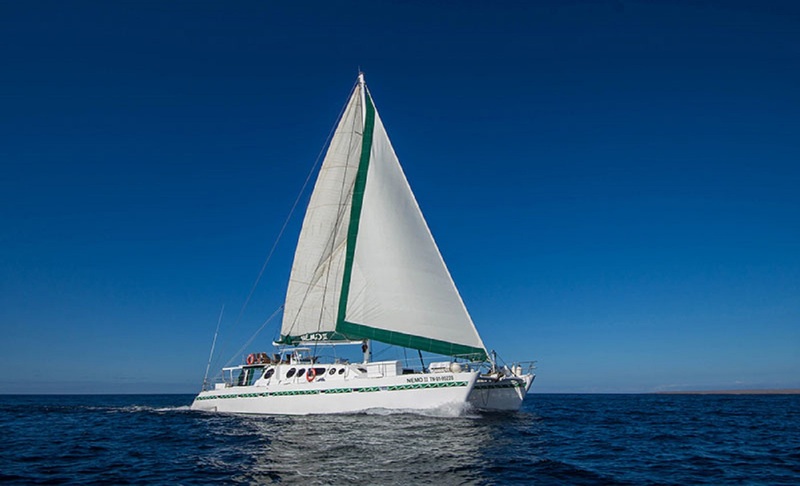 This reserve offers you one of the best possibilities to see the huge turtles of Santa Cruz Island in their natural habitat. You can observe them from very close. The main visit in Puerto Ayora is to the Charles Darwin Scientific Station. An excellent way to begin learning about the islands and their origin and formation is to visit the Station. You can also see how the Galapagos turtles are raised and meet Jorge, the famous solitary turtle. The Scientific Station has its own beach that receives many visitors on weekends. Dinner at night and navigation to San Cristobal. In the morning, visit to Cormorant Point, The visit to Punta Cormorant offers two contrasting beaches. Arriving on shore you will encounter a green sand beach (the green sand is caused by the olivine crystals derived silicates or magnesium and iron) from here you will follow the trail leading to a lagoon where Pink Flamingos and other shore birds can be seen in the distance making their home. Looking into the mud of the lagoon there appears to be 'cracks' in the mud. These cracks are not caused from dryness but are actually the footpaths of flamingos. This is also a good spot for seeing Large-Billed Flycatchers, Small-Ground Finches, Medium-Ground Finches or Cactus Finches. The walk continues to another beach on the other side made of fine white sand particles known as "Flour Beach". 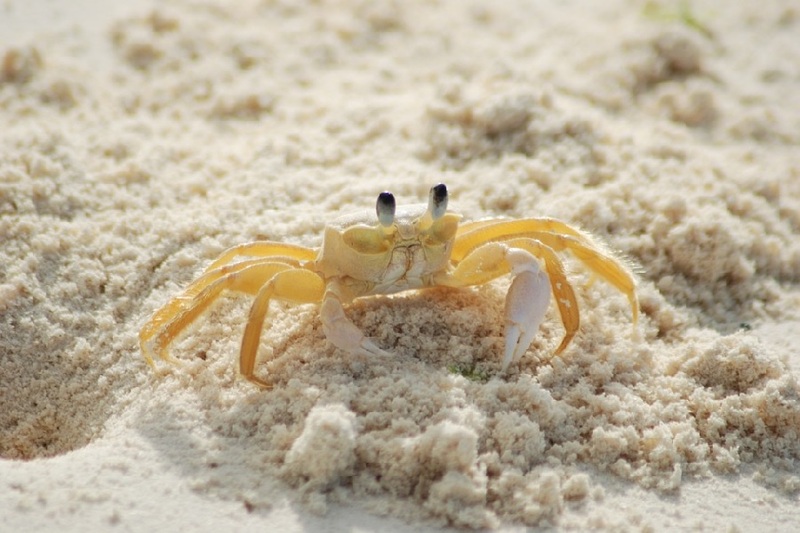 In the waters Ghost Crabs and Rays can be seen swimming. Time permitting you may even go for a swim. Arriving at Post Office Bay you will land on a brown sand beach, passing the sea lions lying in the sun. At the post barrel the guide will pull a hand full of letters for the group. Continuing the tradition, the letters are brought home with the traveller and then mailed to the addressee. Visitors also have the opportunity to send letters of their own. 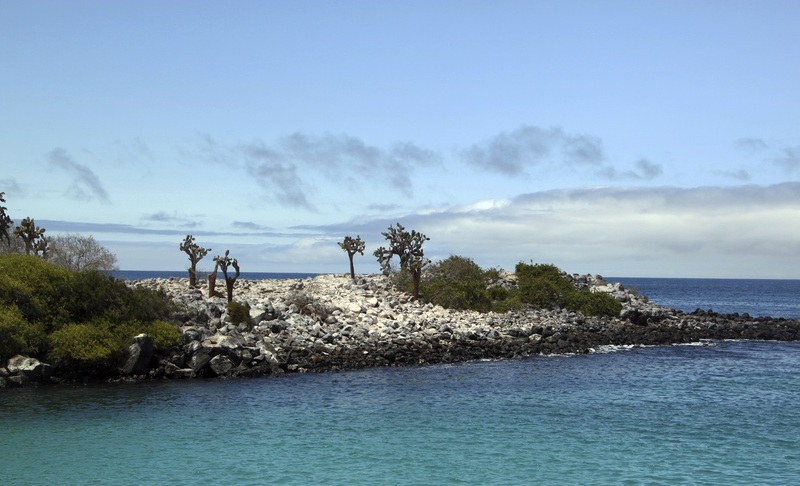 In the morning, you will visit Bartolome, a desolate island with few plants is the most visited and most photographed island in the Galapagos. The island consists of an extinct volcano and a variety of red, orange, green, and glistening black volcanic formations. The best known of the island's features is the Tuff Cone known as Pinnacle Rock. This large black partially eroded lava formation was created when magma expelled from the volcano reached the sea. When the seawaters cooled the hot lava it caused an explosion. The exploded particles eventually fasten together forming a rock composed of thin layers. Bartolome's Pinnacle Rock has become one of the best recognized and most photographed sights in the islands. A prominent sight it was used as a target for US airmen during WWII. Lying beside the Pinnacle Rock are twin half moon shaped beaches. In the afternoon, visit a tiny island just off the southeast tip of Santiago. Its name Chinese Hat describes the island's shape. Those visitors who travel to the island will find its special landscape worth the visit. Though centrally located it is one of the least visited sites in the area. National Park Service restrictions have limited the number of visitors to Sombrero Chino. Multi-day cruises with 12 passengers or less are the only ones permitted at this site. The landing is on a beautiful crescent-shaped white sand beach, home to Sea Lions and Sally Lightfoot Crabs. The trail on Sombrero Chino's explores its volcanic origin, one of the most evident in the islands. In the morning, panga ride in Caleta Tortuga, also known as Black Turtle Cove, It is on the north side of Santa Cruz. You have to go by panga (motorized canoe) to reach it and see its mangrove swamp where there are nesting marine turtles during certain seasons of the year, and also sharks and rays. Finally disembark in Baltra and transfer to the airport. 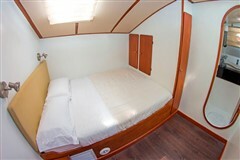 Cabins 6 & 7, one lower single bed and one upper single bed, individual air conditioning, private bathroom and reading light. 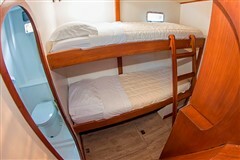 Cabin 5, one lower double bed and one upper single bed, individual air conditioning, private bathroom and reading light. 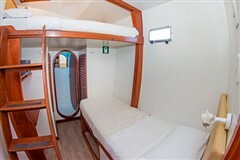 Cabins 3 & 4, one lower single bed and one upper double bed, individual air conditioning, private bathroom and reading light. 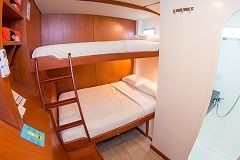 Cabins 1 & 2, one double bed (only for couples), individual air conditioning, private bathroom and reading light. Guide: Naturalist english speaking guide. 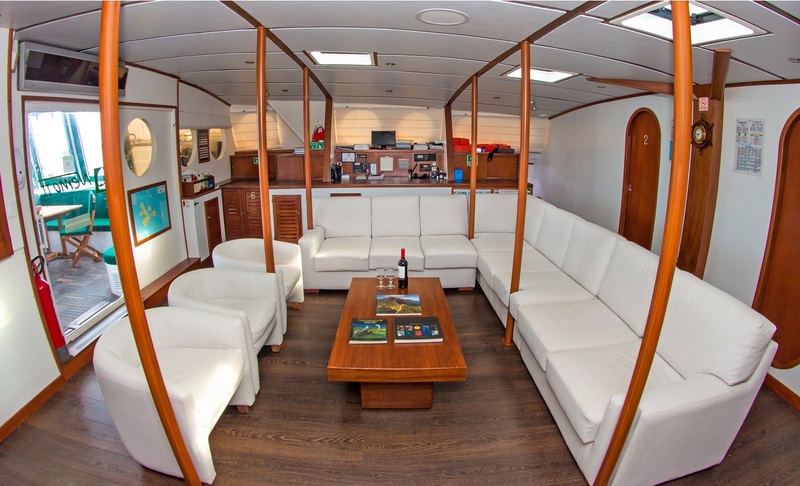 Crew: 6 members: 1 Captain, 1 Helmsman, 1 Sailor, 1 Machinist - Biker, 1 Bar Man - Cabinero, 1 Cook. Electricity: 12 V, 110 V, 220 V.
Engines: 2 engines / 200 HP.